Body odor is a common affliction among women, but many do not realize that it can be somewhat controlled by their diet. There are certain food known to exasperate body odor, which are advisable to avoid if you know you are prone to the problem. Likewise, it is thought that a number of food can help to reduce body odor as well. 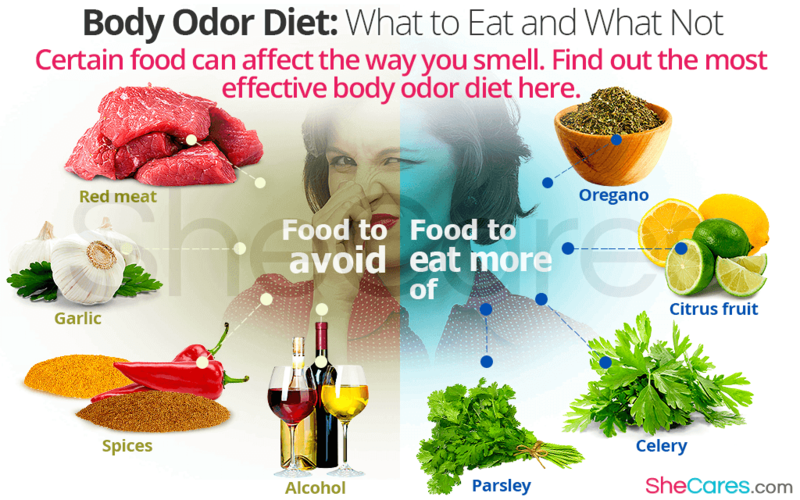 Read on to find out more about the most effective body odor diet. Studies have shown that certain foods can worsen the natural scent emitted by our bodies, and also it is commonly accepted that other foods do, often because these cause use to sweat - and sweating is the ultimate cause of body odor. Red meat. In one experiment, it was discovered that those who consumed a diet rich in red meat were then considered to have an unpleasant and strong body odor, whereas those subjected to a meat-free diet were thought to smell more pleasant. Garlic. Known for its unique and strong smell, garlic can also cause body odor in some women. It is thought that this is more likely if consuming it raw. Women can react to it differently, and so it might not be necessary to cut it out entirely. Spices. Chili, cumin, and curry leaves are just some of the strong spices known to intensify body odor. This is not only because of their heady scents, but also due to the fact that their heat can cause consumers to sweat more. Alcohol. It is widely known that the smell of alcohol can linger on some more than others, especially after a heavy night. Alcohol can cause an unpleasant, potent body odor which is difficult to hide or get rid of. These food will effect everybody differently, and so it can be advisable to cut each one out of your diet at a time, in order to discover which - if any - is relevant to your condition. In addition to potentially avoiding the above foods, many women also benefit from consuming more of certain foods. Below are some of the most popular options for adding to your diet to reduce body odor. Oregano. This herb is known to have antibacterial properties which can be largely helpful for combating the bacteria in sweat - which is the cause of body odor. It is fortunately a very versatile herb that can be added to a number of dishes. Citrus fruit. Limes and lemons in particular are adept at improving smell, due to their own fresh and clean scent. They can also work wonders for cooling the body, and therefore reducing sweat. Try adding a segment or two to water when you drink it. Celery. This green vegetable has a high quantity of water, and works as a diuretic and contains nutrients that can help cleanse your body. This can help your body to remain clean and smelling fresh. Parsley. Like oregano, parsley boasts antimicrobial activity which can help fend off the bacteria that causes body odor. It also has a distinct smell which can dominate over body odor. Some awareness of how and which food can affect the way you smell can be helpful whether or not you are faced with a body odor problem. Many women are unaware of just how much of an effect their diet can have in this way.Find out four more remedies to avoid body odor.